This unit focuses on exploring and deepening understanding of identity, both of self and others, through the use of a variety of artistic and dramatic forms and conventions. Students will work with First Nations, Métis and Inuit visual art, and film. Critical learning moves from using First Nations, Métis and Inuit works into student-developed work exploring identity. Note: each lesson may take more than one period and should be adapted to work with the students that are in your class! How can we use dramatic forms and conventions to explore our own identities and those of others? How can we use scripts to help us understand the ways in which dramatic forms can explore themes of identity? This lesson focuses on helping students develop a working and common understanding of identity using First Nations, Métis and Inuit art as a jumping off point for discussions of identity, voice and culture. How does a conflict/external pressure shape identity? This lesson focuses on helping students explore how conflict and external pressures often shapes our identity and how we express our identities. Students explore the connections between conflict and external pressures, identity and how we choose to share information about ourselves. How can identity be communicated in creative works? This lesson focuses on allowing students to work with First Nations, Métis or Inuit artwork and film to explore how issues of identity can be presented. Who am I? How can I communicate my identity to others? This lesson focuses on helping students further explore identity and how our individual experiences shape who we are. Using the elements and principles of design, students explore the question “who am I?” and create a visual representation of themselves to use as their signature on all further works of art. Assessment: rubber stamp signature logo. How can we stage/bridge representations of ourselves? What choices have I made to communicate my identity? Sketchbook: Students should sketch a representation of their identity. Students should create an identity chart to help them consider the many factors that shape who we are as individuals and as communities. They can be used to deepen students’ understanding of themselves, and groups of people or nations. Sharing their identity charts with peers can help build relationships and breakdown stereotypes. 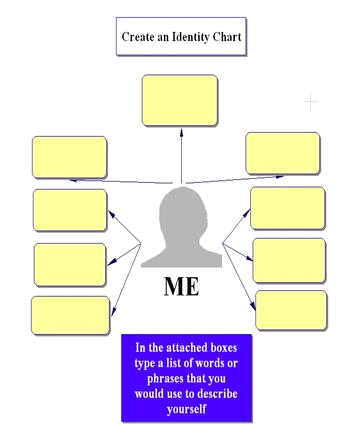 Before creating identity charts, you might have the class brainstorm categories we consider when thinking about the question, “Who am I?” such as our role in a family (e.g., daughter, sister, mother, etc. ), our hobbies and interests (e.g., guitar player, football fan, etc. ), our background (e.g., religion, race, nationality, hometown, or place of birth), and our physical characteristics. It is often helpful to show students a completed identity chart before they create one of their own. Alternatively, you could begin this activity by having students create identity charts for themselves. After sharing their charts, students can create a list of the categories they have used to describe themselves and then use this same list of categories as a guide when creating identity charts for other people or groups. Feel free to make more boxes if needed! After students have had the opportunity to examine, share and discuss their own identities a discussion of how FNMI identities are created, and have been formed and influenced in our society. Similarities, Differences and Problems should be discussed and reflected on in their journal. See below for some basic information for teachers which could be used in class as a basis of discussion. How do we go about identifying or explaining ourselves? What details do we include or omit from our identifications? What types of ways of identifying have been included in the journals? How are these different? How are they similar? What is identity and how can we define it? Explain the goals of the lesson: we will be exploring of the idea of self-identity and have the opportunity to explore how identity can be constructed, especially for a particular culture or people. You know, it’s not a biological issue. It’s a cultural, historical issue and it’s a way of life issue, and it’s not what you look like on the outside, it’s how you carry yourself around on the inside that is important, both in your mind and your soul and your heart. Although First Nations, Métis and Inuit people in Canada have a distinct and unique cultures and histories, they are often lumped together under the umbrella terms Aboriginal or Native. These terms are used to talk about the three peoples that the government recognizes as indigenous to Canada. However, the use of these terms can contribute to a lack of understanding of the diversity found among and within First Nations, Métis and Inuit peoples. How are Aboriginal identities defined? Who defines who is and who is not First Nations, Métis or Inuit? These are complex questions that Aboriginal communities and government officials continue to debate. Establishing citizenship or membership can happen either through informal or formal processes, and how this happens may differ depending on the individual’s station. Some individuals feel that they have always known their identity: they have always know who they are, their family their community and their Nation—and they have always been considered to be members and citizens of said community or Nation. In other situations, identity is more complex and difficult for a variety of reasons, which we will explore. For example, a person who self-identifies in one way but whose identity is not recognized in law may constantly feel the need to justify his or her identity. Frequently people who are part First Nations, Métis or Inuit feel pressured into having to “choose” one identity over another. This need to choose can leave people without a sense of belonging or purpose and with feeling of being disconnected from others. How does a person establish their place in the world and determine their roles and responsibilities regarding others without a community to identify with? **It is important at this time to make sure that students are aware of the meaning of and the different types of conflict. Journal: Students should write a Film reflection/Journal entry which considers the conflicts and external pressures which shape our identity. Sketchbook: students should create a representation of how they think others view them. Have a Think Peer Share regarding the different factors that can make identity difficult, consider the list below to fill in what the students may have missed in their discussions. After the Think Peer Share, Tell students that we will be watching the film the Bear that Wasn’t. What words or “labels” would you use to describe yourself? · What words might others use to describe you? · What words might others use to describe you that you would not choose for yourself? Frank Tashlin uses words and pictures to describe that process. Tashlin tells the story of a bear who is told again and again that he is a “silly man who needs a shave and wears a fur coat.” So many people label him this way that eventually he begins to question his own identity as a bear. Ultimately, the bear recognizes that he is not a man but he is not convinced that he is a bear either. Tashlin’s story is a metaphor for how identity is formed not only by our perceptions of ourselves but also by how others define us. In the following lessons, students will explore the relationship between the individual and society by looking at how their own identities are influenced by others. This is a theme relevant to the study of world history, especially ancient world history. Before the modern era, most cultures placed labels on individuals that were determined at birth—labels such as slave, prince, merchant, or farmer. Reminding students about how, even today, their own identities are shaped by larger society can help students relate to the histories of people whose culture may seem distant and unfamiliar. What made the bear challenge how he saw himself? What techniques did the men use to convince the bear that he wasn’t a bear? What made the bear realize in the end that he was a bear? Discuss the answers as a class. In pairs or small groups learners create an identity chart for the bear. Invite pairs to share their identity charts with the rest of the class. How much of whom we are is determined at our birth? How much of it is something we decide? How does our identity change over time, within certain conditions? How much of it is something that is determined by your experiences with others? How do these perceptions affect the relationships we have in society? Journal Entry: students reflect on their favourite image and whether it is a good or bad representation of Identity and why. Create a gallery wall with a mixture of images that represent FNMI art work ranging from a variety of artists, a couple of the images should be by colonists about Aboriginals (see short list below). Have students walk around and record their initial observations for each of the images. Which of the images represent stereotypical images of FMNI identity? What images challenge these stereotypes? Are there any images where there doesn’t appear to show any evidence of identity? Why/Why not? After students have recorded their initial reactions/answers to the questions have each of them pick one of the images that stand out in their minds and discuss their reactions/answers in small table groups. Have each group pick one image that everyone can agree on as being a good or bad representation of FNMI identity. They should present their rationale to the rest of the class. Explain to the class which images are in fact by colonists and what implications this has had on the formation of Aboriginal identity. Journal: What are some of the similarities and differences between the Aboriginal experience in Urban Centres and that of “my own” experiences? The opening section of the episode shows some street interviews with “average Canadians” discussing Aboriginal stereotypes. What is the general consensus from those interviews about stereotypes surrounding Aboriginal people in Canada? Discuss the impact of some of these stereotypes on Aboriginal people in Canada. We meet comic book artist, Steve Keewatin. Discuss the kind of art he creates. What were his artistic influences, and how did these influences impact the art he creates today? Why are people surprised when he tells them about his occupation and his ancestry? Winnipeg’s Most is a band that is achieving some fame. Describe their success. How do the band members fit some of the stereotypes surrounding urban Aboriginal people? How are they fighting against those stereotypes? Near the end of the episode, Winnipeg’s Most visits some Elders from their local area. How can Elders help Aboriginal youth rebuild their lives? How can their traditional roles be integrated into today’s world? According to this episode, Aboriginal youth are more likely than other Canadian youth to join gangs or to be in trouble with the law. Discuss some of the issues that have created this situation. A major part of the Indian Act involves the creation of reserve lands. How has that impacted Aboriginal people? Why are more and more Aboriginal people leaving the reserves? We meet Kent Monkman, an artist who creates what he refers to as “subversive” art. What is the definition of subversive? How is his art subversive? Why does he choose to integrate romanticized images of Aboriginal peoples? Several of the guests on this episode discuss the importance of having a relationship with the land. What is a relationship with the land and how is it important to many Aboriginal peoples? Have a class discussion about the episode and some of the issues surrounding identity in an urban context. Students should design and carefully carve out a logo (signature) that represents who they are out of a larger pencil eraser (the pink ones are more durable). This stamp is to serve as their signature for all future art work in the course. This is meant to be the culminating portion of the unit. Once brainstorming has happened as individuals have them share their ideas in a Think Pair Share and then hopefully as a whole class. Students should then brainstorm ideas for a Mixed Media (Medium) painting (or poster) which illustrates either the need to build a bridge, or what it would take to build a bridge to a complete understanding between different identities and world views.